Vintage Moroccan necklace of glass beads and tiny metal beads and an old vintage metal dangle bead. 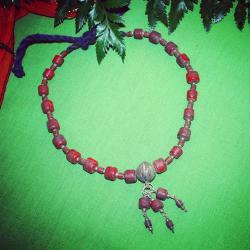 Bead Color: I believe these beads were once a brighter red, but are now old and appear a deep red color. Vintage necklace from Morocco, including glass beads and tiny metal beads. A nice old dangle bead in the center has the same glass beads as the rest of the necklace. Total length including ties is 24 inches. Can be tied shorter or longer as desired, up to about 19 inches or so. A nice smaller piece when weight and bulk won't do. This necklace appears to be very old and the patina on the beads may be the ubiquitous tribal dirt.